Translated by Al Mubadara, the Palestinian National Initiative, this document is currently in the process of being signed by all of Palestine’s factions and parties. Under the auspices of Egypt, delegations from the Fatah and Hamas movements met in Cairo on April 27, 2011 to discuss the issues concerning ending the political division and the achievement of national unity. On top of the issues were some reservations related to the Palestinian National Unity Accord made in 2009. The political parties of both Fatah and Hamas agree that the tasks and decisions of the provisional interim leadership cannot be hindered or obstructed, but in a manner that is not conflicting with the authorities of the Executive Committee of the Palestine Liberation Organization. Both Fatah and Hamas agree to form a Palestinian government and to appoint the Prime Minister and Ministers in consensus between them. 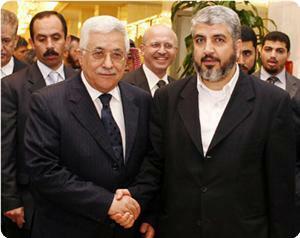 Both Fatah and Hamas agree to reactivate the Palestinian Legislative Council in accordance to the Basic Law. The Cast Lead Operation commander speaks bluntly on the Israel’s view of Gaza as an ‘ideal training zone’ for its soldiers and weaponry. Israel used the war in Gaza in 2008 as a training opportunity for its armed forces to test new weapons, designate Israeli military chief of staff has revealed. In a speech at the Begin-Sadat Center of Strategic Affairs at Bar-Ilan University, Major General Yoav Galant said that Gaza was an “ideal training zone” as it lacks a strong enemy that could inflict serious casualties upon Israel. Galant was the operation commander of Israel’s Cast Lead Operation on Gaza between December 2008 and January 2009 in which more than 1600 Palestinians were killed. Most of the fatalities were among women and children. 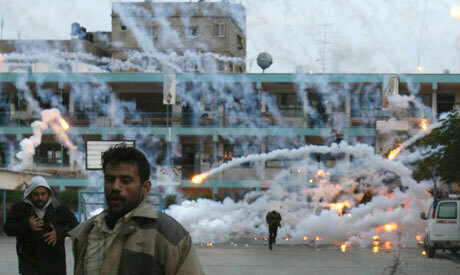 Under his command, the Israeli armed forces openly used white phosphorus shells fired from 155mm artillery guns in the crowded Gaza Strip which were . “Although Israel’s military capability is much stronger than [that of] Hamas, we consider them as our fiercest enemy,” he said. With regards to the wave of Arab uprisings, Galant expressed his view that that none of the ongoing revolutions in the Middle East have any positive short or long-term potential for the future of Israel’s security. Reports suggest warrants could include Gaddafi and his son Saif al-Islam in move intended to increase pressure on Tripoli. The UN security council voted unanimously in February to refer Gaddafi’s violent crackdown against anti-government demonstrators (above). Senior Libyan officials face international arrest warrants for crimes against humanity, the United Nations security council will be told today. Luis Moreno-Ocampo, chief prosecutor of the International Criminal Court, is to brief the council about crimes committed by Muammar Gaddafi‘s forces since the Libyan uprising began in mid-February. Western diplomats say the move is intended to ratchet up international pressure on Tripoli. Ocampo revealed that up to five warrants are likely to be issued in the next few weeks with the approval of the ICC’s pre-trial chamber. No names have been disclosed. But Al-Arabiya TV reported that the warrants could include Gaddafi himself and his son, the discredited reformist Saif al-Islam, who has strong UK links. It said others being targeted include Libya‘s former foreign minister, Moussa Koussa, who defected to the UK, and Abu Zeyd Omar Dorda, director general of the Libyan External Security Organisation. Koussa is the most important defector from the regime so far, and British officials had hoped his defection might persuade other key Libyans to abandon Gaddafi, although observers warn of the potential for a clash between a pragmatic approach to weakening the regime and a principled commitment to international criminal law. The security council voted unanimously in February to refer Gaddafi’s violent crackdown against anti-government demonstrators to The Hague-based ICC. That move was widely criticised as premature, leaving the Libyan leader and other key officials no exit strategy as the international response to the crisis escalated into the armed action now being undertaken by Nato. Turkey’s prime minister, Recep Tayyip Erdogan called on Gaddafi to step down “immediately,” echoing calls by Barack Obama, David Cameron and France’s Nicolas Sarkozy. Switzerland, meanwhile, has frozen assets worth up to £585m connected to Gaddafi and the former presidents of Egypt and Tunisia. Micheline Calmy-Rey, Switzerland’s president and foreign minister, disclosed that of the total amount of frozen assets, 957m in Swiss francs, some SFr360m (£246m) is linked to Gaddafi and his associates, SFr410m (£280m) is tied to Hosni Mubarak, the Egyptian president who stood down in February after 18 days of protests, and SFr60m (£41m) to Zine al-Abidine Ben Ali, the Tunisian president who fled in January after an uprising. In Cairo, Mubarak’s sons, Gamal and Alaa, face renewed questioning by a public prosecutor on their roles during their father’s 30-year rule. Mubarak is being treated for a heart condition in a hospital in Sharm al-Sheikh, where the family has remained since February. The UK has only provided an update on its efforts to freeze the assets of the Gaddafi regime. Speaking in March, David Cameron said £12bn had been frozen by the UK after the Libyan Central Bank and the Libyan Investment Authority were added to the asset-freezing list. No updates have been provided on Mubarak or Ben Ali, although the sums are expected to be smaller because neither has sovereign wealth funds of the size run by the Libyan Investment Authority. The fate of billions in public funds alleged to have gone missing is a talking point in all three countries. The US has so far seized $34bn (£20.5bn) in assets connected to Gaddafi, although it has yet to act against any assets linked to Ben Ali or Mubarak and their associates. Calmy-Rey did not give details of the banks holding the assets. Switzerland is trying to become more open about its banking, in part because of pressure from the US three years ago on Swiss bank UBS to reveal the identities of 20,000 clients. Officials said that the decision to reveal the sums frozen indicated that the Swiss felt they were unlikely to uncover many more assets linked to the three. Although amounts have been revealed, none of the assets has been released, as there is insufficient proof they were obtained illegally. 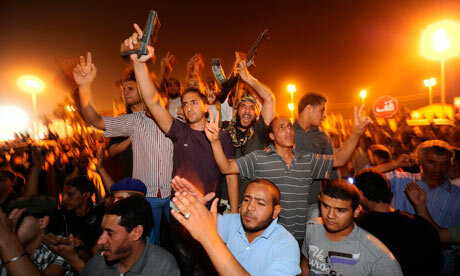 While Tunisia and Egypt have begun steps to reclaim the assets, Gaddafi remains in the control of Libya’s government. Switzerland has begun returning assets to Haiti, 25 years after freezing money belonging to Jean-Claude Duvalier, its former leader. The Swiss said they believed some SFr5.8bn (£4bn) had been frozen and that it could now “initiate forfeiture proceedings”. The precise wealth of the three Middle East leaders is unclear. Forbes estimated in 2008 that the Tunisian president’s fortune was $5bn. In February, officials in the Serious Organised Crime Agency began the process of tracing the bank accounts of Mubarak and his cabinet in the UK, while Britain froze the assets of Gaddafi and his five children amid reports the Libyan leader had moved £3bn to Britain. Some £900m of Libyan currency in storage at a secure compound in the north-east of England was impounded. Op zaterdagmiddag 14 mei organiseert het Nederlands Palestina Komitee in Amsterdam een openbare bijeenkomst. Hoofdgast is dr. Daud Abdullah – Palestijn, wonend en werkend in Londen, waar hij ondermeer verbonden is aan het Palestinian Return Center. Het Palestinian Return Center behartigt de politieke belangen van de Palestijnse vluchtelingen, in het bijzonder hun recht op terugkeer naar de gebieden waaruit zij in 1948 en nadien door Israel verdreven dan wel gevlucht zijn. David Cronin, journalist en schrijver van het boek “Europe’s Alliance with Israël” zal een column voordragen en als co-referent optreden. Stan van Houcke en Jan de Hertog zijn twee van de andere co-referenten die zijn gevraagd op de voordracht van de heer Abdullah te reageren, waarna ook de zaal bij de discussie zal worden betrokken. Vooraf zal Midden-Oostenspecialist Robert Soeterik een korte beschouwing over de Nakba geven. Wij nodigen u van harte uit de bijeenkomst bij te wonen en hopen u daar te kunnen verwelkomen. END THE SIEGE OF GAZA – FREE PALESTINE! END THE SIEGE ON GAZA – FREE PALESTINE! Speakers include Andy Slaughter MP, Caroline Lucas MP, Baroness Jenny Tonge, Reem Kelani, Jody McIntyre, with more speakers to be announced! We envision a stable, democratic, economically prosperous Pakistan. We seek to empower all of Pakistan’s citizens, regardless of gender, faith, class or creed, to achieve their aspirations for the future. We promise to guarantee, unreservedly and absolutely, all the fundamental rights that our citizens deserve and demand. These include, without reservation, all the rights enshrined in the Universal Declaration of Human Rights adopted by the UN General Assembly in December 1948. We undertake to end forever the detention of our citizens – all of our citizens – without a warrant or court order. We swear to extirpate the loathsome practice of torturing detainees in police custody to obtain confessions or information. We refuse categorically to ‘hand over’ our citizens to any foreign government without due legal process. We demand that all our citizens – even the poorest of the poor – be treated with respect and dignity by all agents of the state. We resolve to make the legal system free of any influence from the government or any external agencies. We promise to make due judicial process a pillar of our society. The law will be applied with fairness and integrity. No one, not the rich, not the influential, will be exempted. Corruption has ramified deep into the foundations of our society. We vow to begin the difficult process of disinterring it. We pledge to combat crime by attacking its causes: poverty, hopelessness destitution, social deprivation, and the spread of weapons and drugs. We resolve to make literacy a ‘universal’ right of all Pakistanis. We recognize the inherent and exceptional creativity and industriousness of the Pakistani nation. We pledge to provide the enabling socio-economic framework for these abilities to develop, thrive, and reach their full potential. We promise to bring about a fundamental shift in the way politics is conducted in Pakistan. We will bring into politics fresh faces and minds. We will not field candidates – for any assembly – who have previously been elected to any public office. All our candidates will be chosen from the ranks of professionals: teachers, doctors, engineers, architects, lawyers etc. These will be people who have distinguished themselves in their communities by their honesty, selflessness, dedication and professionalism. We will not be the party of an individual or a family. We will develop an institution, a democratic institution, which will elect its own leaders based on the quality of their character, not the character of their blood. The government of Israeli Prime Minister Benjamin Netanyahu, seen here during a Cabinet meeting on May 1, says it will withhold the transfer of $90 million in tax funds and customs fees for the Palestinian Authority. The move comes after news of a reconciliation deal between two key rival Palestinian factions. Israel is taking a tough line against a reconciliation deal between two rival Palestinian factions. A unity agreement is set to be signed Wednesday in Cairo by Fatah, which controls the Palestinian Authority, and Hamas, a hard-line Islamist group that rules the Gaza Strip. The agreement would help end a bitter four-year divide between the two groups. But Israel considers Hamas a terrorist organization and is leveling punitive actions against the Palestinian government for agreeing to the deal. The Israeli government wasted no time in denouncing the agreement when it was announced last week. Israeli Prime Minister Benjamin Netanyahu told the Palestinian government it would have to choose whether it wants peace with Israel or with Hamas. Since then, Netanyahu’s government has been ratcheting up both its rhetoric and its actions to undermine the reconciliation agreement. On Sunday, Israel announced it would withhold the transfer of more than $90 million in tax funds and customs fees for the Palestinian Authority, led by Mahmoud Abbas. Surely no one could expect Israel to transfer money into the hands of a world-recognized terror organization such as Hamas, and it’s up to the Palestinian government to decide what they want to do. Israeli Foreign Ministry spokesman Yigal Palmor says the Israeli government is worried the money will go to Hamas. The tax payments account for more than two-thirds of the Palestinian Authority’s budget. They have been collected and transferred by Israel since the 1990s as part of interim peace deals. Hanan Ashrawi, a member of the Palestinian Legislative Council, says these sorts of moves by the Israeli government are ridiculous. Ashrawi says uniting Palestinians is the only way to bring stability to the region and push forward the peace process. Hanan Ashrawi, a member of the Palestinian Legislative Council, says that uniting Palestinians is the only way to bring stability to the region and push forward the peace process. Here, she listens during a session of the Palestinian Parliament on March 27, 2006. “If Netanyahu and the current Israeli leadership had any sense, which I doubt, then they would certainly have been encouraged by this development rather than attempting this very, very irresponsible, ignorant approach of divide and conquer and find excuses to avoid talking to the Palestinians,” Ashrawi says. Mustafa Barghouti, a longtime political activist who helped negotiate the reconciliation agreement, says he’s also surprised by Israel’s reaction. A Good Political Move For Israel? Hillel Frisch, senior researcher at the Begin-Sadat Center for Strategic Studies in Jerusalem, says the Palestinian reconciliation actually helps Netanyahu at a delicate diplomatic moment. There is growing support for a bid by the Palestinian government to win recognition of statehood at the United Nations General Assembly in September. Frisch says Abbas’ decision to reconcile with Hamas could change things. If Netanyahu and the current Israeli leadership had any sense, which I doubt, then they would have been encouraged by this development rather than attempting this very, very irresponsible approach of divide and conquer. But Frisch says it’s a different story on the security front. Egypt, which brokered the reconciliation deal, has indicated it will soon reopen the Rafah border crossing it shares with the Gaza Strip — the area controlled by Hamas. Israel says this will help Hamas build up its weapons stocks. Palmor, the Foreign Ministry spokesman, says Israel would like to preserve the common interests of security and border arrangements with Egypt. “There are many security challenges and threats across the border, and we need to keep the same level of cooperation that we’ve had in the past, in the interest of both countries,” Palmor says. Still, Palmor says Egypt is changing and Israel isn’t sure what its new policies are. The Saudi interior minister should immediately release Fadhil Makki al-Manasif, a human rights activist arrested on May 1, 2011, in ‘Awwamiyya in the Eastern Province for taking part in peaceful demonstrations, Human Rights Watch said today. Al-Manasif’s arrest follows amendments to the Press and Publications Law on April 29 that further restrict the right to free speech in Saudi Arabia, and days after the authorities arrested at least 20 peaceful protesters, including two bloggers. “The latest arrests of peaceful dissidents brings the climate for reform in Saudi Arabia to the freezing point,” said Christoph Wilcke, senior Middle East researcher at Human Rights Watch. “The Saudi ruling family has shown no signs that it might ease its iron grip on the right to express political opinions.” Al-Manasif, 27, has documented and written about human rights violations, in particular against Shi’a Saudis, for the past two years. He has documented arrests since February of participants in peaceful demonstrations in towns across the Eastern Province, such as a peaceful candlelit march by women in Qatif on April 14. A colleague of al-Manasif told Human Rights Watch that on April 30, officers of the Ministry of Interior’s Criminal Investigation Department came to his family’s house to arrest al-Manasif and confiscated his father’s national identity card when they did not find him there. The next day al-Manasif presented himself at the police station and was immediately taken into custody for “participating in the demonstrations.” Saudi authorities arrested more than 20 participants in peaceful demonstrations in the Eastern Province over the previous week, including two bloggers, Reuters reported. The bloggers, Mustafa al-Badr Al Mubarak and Husain Kazhim al-Hashim, had participated in and written about the protests, local sources reported. Since February, peaceful demonstrations of between dozens and hundreds of Saudis have occurred regularly to call for the release of political prisoners, predominantly in the Eastern Province. Small protests for the release of political prisoners led by women have also taken place in Riyadh, the capital, in March. The latest arrests bring the number detained since February 2011 for peaceful expression or assembly to at least 145, a Saudi human rights activist told Human Rights Watch. Human Rights Watch has confirmed at least 120 arrests before the recent arrests of more than 20 people. The Sa‘ud family rules Saudi Arabia as an absolute monarchy. There are no elections to national institutions and no effective means of popular participation in decision making. In early March, the Interior Ministry headed by Prince Nayef bin Abd al-‘Aziz and the Council of Senior Religious Scholars, the highest law-interpreting body, reiterated a ban on all demonstrations.On April 29, King Abdullah bin Abd al-‘Aziz issued a decree amending the 2000 Press and Publications Law, further restricting the right to free expression. The decree prohibits publishing anything that “contradicts rulings of the Islamic Sharia [law] or regulations in force,” anything that “calls for disturbing the country’s security, or its public order, or services foreign interests that contradict national interests,” anything that “causes sectarianism or that spreads divisions between citizens,” and that “damages public affairs in the country.” New restrictions also include a prohibition on violating the “reputation, dignity, or the slander or libel” of the chief mufti, members of the Council of Senior Religious Scholars, or any other government official or government institution, and publishing without official consent proceedings from any investigations or court trials. A January 2011 decree extended provisions of the Press and Publications Law to online expression. Two days before his arrest, al-Manasif sent Human Rights Watch a copy of these new regulations, which the Saudi daily newspaper Al-Watan also published. Forces loyal to Libyan leader Muammar Gaddafi bombarded the rebel-held town of Zintan in the Western Mountains with over 40 Grad rockets late on Tuesday, a rebel spokesman said. A Libyan ambulance driver from Zintan who crossed into Tunisia on Tuesday told Reuters the town had come under intense shelling by pro-Gaddafi forces. Palestinian factions headed by Hamas and Fatah have signed an agreement ending the national split, sources in Cairo told the Palestinian Information Center on Tuesday. Among those who gathered for the signing were Hamas’s political bureau chairman Khalid Mishaal as well as Azzam al-Ahmed and Samir al-Rafaa’i from Fatah, Ramadan Shalah from Islamic Jihad, Ahmed Jibril from the Popular Front for the Liberation of Palestine (General Command), Mahir al-Tahir from the Popular Front for the Liberation of Palestine, and Mohammed Ibrahim from the Egyptian intelligence services. A high-profile Egyptian official said that Egypt directed an invitation to attend a signing ceremony on Wednesday at Arab foreign ministers as well as those from China, Russia, Turkey, and European countries, Arab League secretary-general Amr Moussa and UN secretary-general Ban Ki-moon, OIC secretary-general Ekmeleddin Ihsanoglu, and First Vice-President of the European Commission Cathy Ashton. The official said arrangements were being made in full swing to cap off procedures relating to the signing and that the there was a very positive atmosphere. He said parties agreed that the upcoming stage would require increased efforts and “political will” to turn the deal into a reality. It is scheduled after the signing to begin consultations for forming the new government. An Arab committee headed by Egypt will go to the Palestinian territories to see that the deal is implemented and that obstacles are removed ahead of carrying out the deal’s articles, especially those relating to security and the integration of West Bank and Gaza institutions. Senior Hamas official Salah al-Bardawil said in a press statement that Hamas signed two documents, one was the Egyptian paper as was, and the other was the inter-Palestinian understandings paper, a reference for disputed issues listed in the Egyptian paper. “Talk about Hamas signing the Egyptian paper as is without the inter-Palestinian understandings paper is not accurate. That’s because we signed the Egyptian paper as is, but we added the inter-Palestinian understandings paper that contains Hamas’s observations and amendments required for the Egyptian paper,” Bardawil said. “Whatever the case, we in Hamas are determined to move forward in achieving reconciliation and ending the split that only serves the Zionist enemy,” he went on to say.